Posted on May 7, 2015 by Katrina C.
The effect of light on an object can change its color appearance significantly. Perhaps you remember the notorious “Is That Dress White and Gold or Black and Blue?” debate-turned-viral phenomenon at the beginning of the year. Many people were surprised at how drastically color perception could change based on lighting alone. However, this is not a new phenomenon. Color measurement instrumentation has been used to address the issue of difference in color perception for decades. 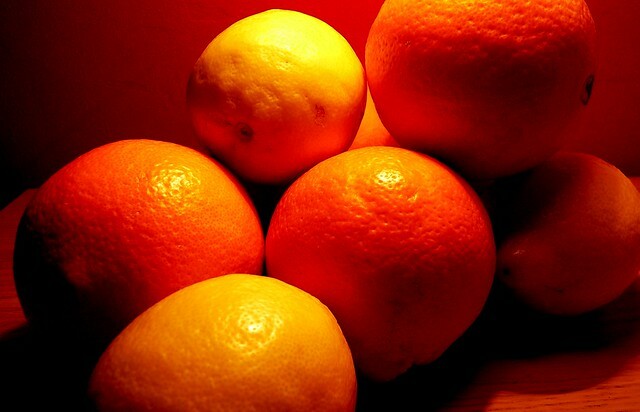 In particular, spectrophotometry can measure the effects of direct and indirect light by controlling the light source and quantifying true color in a controlled environment. This technology reduces visual discrimination and ensures color consistency in a number of industrial applications. 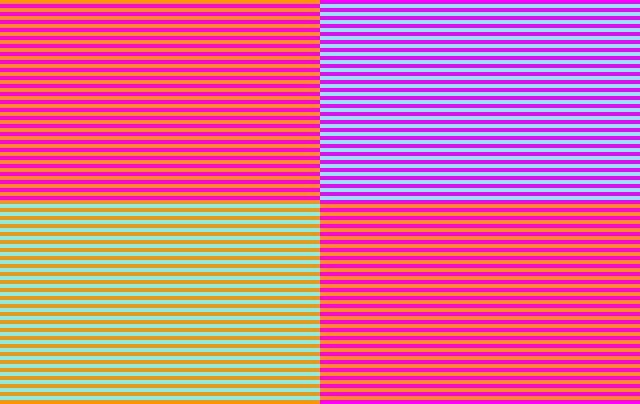 In the image above, the blue lines in the top right corner are exactly the same color as the green lines at the bottom left. This represents how color perception and visual discrimination can be altered greatly by various elements. Whether matching preformed car parts or measuring color consistency in baked or fried foods, it is important to quantify various shades and hues in a way that matches the perception of color as it is seen by the human eye. However, many elements affect color perception such as lighting, viewing angle, surface texture, background color, size, and shape. In addition to that, the subjectivity of visual discrimination from viewer to viewer means that people perceive colors differently. In order to ensure color consistency throughout the various industry applications, color measurement instrumentation is required to ensure a perfect match. Consider the picture below: both flowers are the same color, but their exposure to light, position, and texture allow them to be perceived as different. There are many factors that influence color perception. The lighting, angle of observations, and texture of these flowers allow them to be perceived as different colors- but they’re the same. To maintain consistent color perception, instrumentation must use human-eye technology for visual acceptance. This technology is based on a model of human color perception, where a spectrophotometer is used to view light that is reflected or transmitted off of an object. Specific values are then recorded to correspond with the spectrum of light that they represent, offering quantifiable and repeatable color measurement data. Spectrophotometry is necessary to maintain a consistent color across products, which helps to ensure the quality, safety, and longevity of hundreds of products. Color perception can change based on variations in lighting and these changes often influence consumer choice. Many industries utilize color technology to monitor color consistency and to match consumer expectations. FOODS: In food and agricultural products, color measurement instrumentation can be used to determine ripeness and peak harvesting dates, which can ensure a longer shelf-life for these products, thereby helping to meet consumer expectations. This same technology can also be used to determine the various components of dairy-based products. This helps to ensure product safety and proper labeling. Many snack food items depend on spectrophotometry to maintain consistent color perception and repeatability from batch to batch. PHARMACEUTICALS: Color measurement plays a significant role in the pharmaceutical industry. Spectral technology offers the ability to detect microscopic impurities that cannot be identified by the human eye alone. Specific prescription drug formulations rely on this technology to ensure proper dosage and to monitor products for impurities or safety issues. Color itself is used in pharmaceutical products to differentiate between specific medications, allowing patients to easily identify their medications and avoid dangerous errors. CHEMICALS: The future of the chemical industry depends upon spectrophotometry to provide a non-destructive method of analysis. The applications of this technology continue to grow as new methods are discovered and research continues to develop. From paints and coatings to water purity and chemical compound identification, spectrophotometry is making its mark in the world of chemical analysis. PLASTICS: Plastics can range from polymer pellets and preformed plastics, to coatings and films used on many various industrial components. Color technology allows manufacturers to monitor slight changes in color and appearance. This technology is also being applied to energy saving materials that rely on reflective value measurement to provide better efficiency to consumers. At HunterLab, we cover a wide range of industry applications. Our expert staff is knowledgeable in the various methods of spectrophotometric analysis and by working with industry leaders, we have developed instrumentation specifically designed to meet each unique challenge or need. We offer a wide variety of spectrophotometers that are easy to use and have an option for an size of budget. Our friendly staff is here to answer questions and help you choose a color measurement tool that will work best for your specific need. We provide continuing support to ensure that our instrumentation is utilized to its full potential and that you get the most out of your color measurement tool. Contact HunterLab and see how spectrophotometry can revolutionize your business today.